This is one of my favorite fruits to eat. This fruit is amazing because it has natural enhancers to the human body, has lycopene, beta carotene and the rising star among its phyto-nutrients called citrulline, whose beneficial functions are now being unraveled. Among them is the ability to relax blood vessels. It also works wonders on the heart and circulation system and maintains a good immune system. 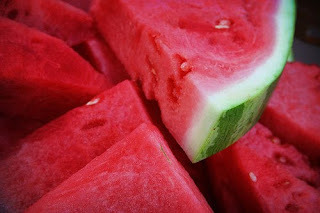 Water melon has a lot of beneficial ingredients that are good for our body. And the list of its very important healthful benefits grows longer with each study.